I would like to "highlight" a featured post above all other posts with a special indicator. 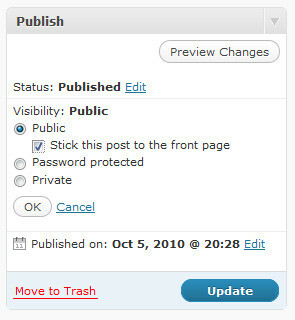 Is there a feature in WordPress that will do this or do I need to install a third party plug-in? I am using a custom WordPress install (not WP hosted). In the "Page Attributes" metabox (labelled as Publish), if you click the "edit" link next to the Visibility option, there is a checkbox which allows you to "Stick this post to the front page". Unless a theme overrides the default query, that post will show up above all the others. In addition, it adds the class name "sticky" to the attributes returned by post_class(), so you can style it however you want. Not the answer you're looking for? Browse other questions tagged posts sticky-post or ask your own question. How to automate featured posts number? Where is the sticky post option?